Chris Paul is making waves in the NBA with his excellent quarterbacking skills with the Los Angeles Clippers. In the sneaker market, the superstar point guard is also making a lot of noise after his signature shoe with Jordan Brand came out in excellent colorways. The Jordan CP3.VI is now available in Gym Red/Black-Cement Grey and Midnight Navy/White-Cement Grey colorways. 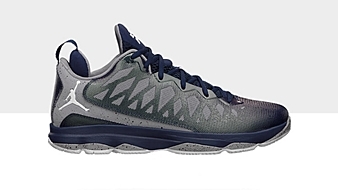 The first one is a Clipper-related kick, while the other is also dubbed as the “Georgetown” edition of the low top kick. Both colorways looks very impressive so make sure to grab your own pair for just $125 now!